My friend has a book birthday today with the release of Many Strange Women. Her name is Parker J. Cole and she is also running a contest with rafflecopter. The prize is $100 giftcard to Target or Amazon. She also has other giveaways going on, so you should check it out! 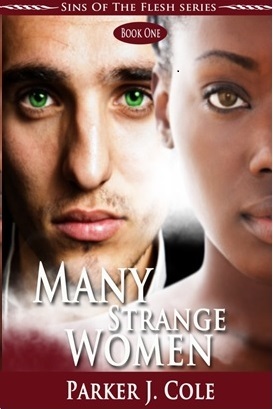 Many Strange Women, an inspirational romance novel by award-winning author Parker J. Cole, is a story of an unlikely couple Solomon Greene and Celeste Martin who never expected their relationship would be anything more than a bargain. Synopsis: Solomon Greene made a deal with God–If He’d send him an unattractive woman, he’d marry her on sight and do what was spiritually right by God. After all, he needed that kind of wife to help him escape from his sordid past. Celeste Martin made a deal with Solomon. She’d be his ugly wife. All she wanted in return was his name. She was in love with her sister’s fiancé and he would be the only man she’d ever love. Solomon had no idea that he’d find his wife fascinating. Celeste didn’t know that one taste from her husband’s lips would have her wanting more. Yet many strange women were between them. Could Solomon ever escape from his past? Could Celeste ever love her husband? You don’t want to miss out on the week-long Many Strange Women launch from January 28th to January 29th. Like Parker’s Facebook page and you’ll be automatically entered into the giveaway. In addition to the Facebook party, you can enter the grand prize drawing below for a chance to win a $100 gift card to either Target or Amazon (you choose! ), or choose from the prize gallery.